A 15 year-old male, with a past medical history of intermittent asthma, presents with a chief complaint of diffuse abdominal pain, nausea, and two episodes of non-bloody, non-bilious emesis. His symptoms began five hours prior to arrival, and are not accompanied by diarrhea, constipation, genitourinary, urologic, or musculoskeletal symptoms. He provides limited history and appears tearful. On direct questioning, he endorses that he attempted suicide the night prior by taking a “handful of ibuprofen.” He does not know the exact number of pills, but estimates somewhere between 50 and 100, and does not know the dose strength. His mother, a clinical pharmacist, believes they were 200 mg tablets, and that there were no other pills in the house. The patient endorses feelings of depression in the prior month, and blames himself for his father having fallen off a roof (without injury) two years prior. He attends high school and is up-to-date on his vaccinations. He is a non-smoker, does not use alcohol, and endorses occasional marijuana use. His only medication is an albuterol inhaler as needed. Initial vital signs: BP 122/82, HR 68 BPM, Temp 98.6 F, RR 20, and SpO2 100% on room air. Physical exam is notable for RUQ and LUQ tenderness without peritoneal signs. There are no scars or superficial cuts. He is tearful, but alert and oriented to person, place, and time. The patient was placed on a cardiorespiratory monitor. Workup consisted of an EKG plus typical toxicologic labs, and consultation from poison control. His EKG showed normal intervals and aVR morphology. Labs were notable for an acetaminophen level of 27 ug/mL and a slight elevation in transaminases, with AST 56 IU/L, and ALT 62 IU/L. On further questioning, the patient confessed that multiple types of pills were taken. Ingestion occurred at 2:00 AM, 14 hours prior to arrival. Given the poor history and elevated acetaminophen level, treatment based on the Rumack-Matthew nomogram (Figure 1) was felt to be beneficial. Figure 1: Rumack-Matthew nomogram for acetaminophen ingestion. The patient’s mother was concerned about his history of asthma, and her knowledge that NAC can cause bronchospasm; however, the benefits of treatment were felt to outweigh the risks. He was started on a standard 21-hour protocol, with a loading dose followed by two tapering doses. Approximately one hour after the initial loading dose, the patient began to experience wheezing, a diffuse urticarial rash over the face, neck, shoulders, and thorax, and oral angioedema. He also became tachycardic. Given concern for a severe allergic reaction, bronchospasm, and possibly anaphylaxis, the infusion of NAC was held and he was treated with nebulized albuterol, IV diphenhydramine, IM epinephrine, IV normal saline, and IV corticosteroids. He was monitored in the emergency department for three hours, although his reaction resolved within 30 minutes. The decision to restart NAC was considered, weighing the risk of possible anaphylaxis against the benefit of NAC to minimize potential hepatic insult. Given the low acetaminophen level, a repeat drug level and hepatic function panel were sent to inform this decision. These repeat labs came back with an undetectable acetaminophen level (now at 15 hours post-ingestion) and unchanged transaminase levels. NAC was not restarted on the basis of presumed completion of metabolism. The patient was admitted to the pediatric intensive care unit for monitoring, serial drug levels, and hepatic function panels. No further treatment was required during hospitalization. He was transferred to the psychiatry service on hospital day three for inpatient management of suicidal ideation and major depressive disorder. He did well with therapy and was discharged. This case illustrates elements of toxicity from two common over-the-counter medications, complicated by an adverse reaction to a life-saving treatment. Acetaminophen toxicity is a common emergency department phenomenon, and while ibuprofen is generally well-tolerated, it can cause toxicity at high doses. Acetaminophen is metabolized by the liver via two pathways. First, conjugation to sulfate or glucuronide, which generates non-toxic metabolites, and second, via the CYP450 system, which generates a toxic free-radical metabolite, N-acetyl-P-benzoquinone (NAPQI). NAPQI is neutralized by glutathione (Figure 2). 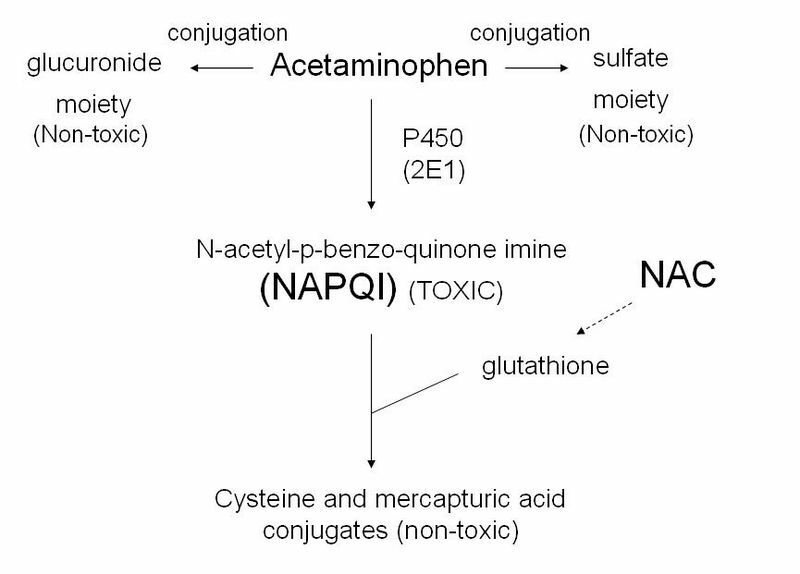 When acetaminophen is consumed in toxic doses, the pathways leading to nontoxic metabolites are overwhelmed and the accumulation of NAPQI depletes glutathione. In turn, the liver is unable to eliminate free oxygen radicals via glutathione, resulting in oxidative damage and mild, moderate, or fulminant liver failure if glutathione is not regenerated. NAC can be given orally or intravenously to manage acetaminophen overdose. Considerations for route depend on the severity of presentation and patient tolerance to PO medications. The duration of treatment varies by route. With IV, which was chosen for our patient due to poor PO tolerance and limited clarity around the time and quantity of ingestion, a loading dose (150 mg/kg administered over one hour) is then followed by tapered IV infusions over the next twenty hours (50 mg/kg administered over four hours, and 100 mg/kg administered over sixteen hours). Regardless, this anaphylactoid reaction prompts considerations about appropriate treatment and, if stopped, how and whether or not to restart the drug. The reaction itself, even when severe, typically does not necessitate cessation of therapy. A common approach to managing the reaction includes temporarily holding the infusion, initiating the normal anaphylactic countermeasures, then restarting the infusion at half of the previous rate after symptom control. Generally, the ongoing infusion is well-tolerated once histaminergic blockade is in place. This off-target effect has no effect on the critical reaction of regenerating hepatic glutathione stores. NAC is very effective at preventing fulminant hepatic failure, even in severe cases of overdose, and restarting treatment should be a high priority. In this case, the patient’s parents refused to restart the medication given his severe reaction. He had not been previously exposed to NAC, which suggests that his reaction was likely anaphylactoid as opposed to anaphylaxis. His acetaminophen level at 14 hours had scored onto the lowest acceptable treatment line on the Rumack-Matthew nomogram and his liver function was only notable for a minimal-mild elevation in transaminases. Given the lower concern for severe toxicity, and repeat labs demonstrating an undetectable acetaminophen level with no appreciable change in hepatic function, the parents and treatment team were comfortable without restarting it in this case. In summary, treatment with NAC may be complicated by histamine-mediated anaphylactoid reactions, which are commonly limited to cutaneous reactions easily treated with histamine antagonists. Severe reactions may necessitate adjunct treatment from inhaled or intravenous beta-agonists, intramuscular beta-agonists, intravenous glucocorticoids, and fluids. True anaphylaxis requires previous sensitization. Unless extenuating circumstances or clinical context exist, NAC should be restarted after treating the reaction. Elevations in INR are common and do not imply liver failure unless they continue to rise. Farrell SE, Miller MA. Acetaminophen Toxicity. Wolters Klewer, eMedicine. Updated 22 Jan 2018. Accessed 24 Sep 2018. Wiegand TJ, Schlamovitz GZ. Nonsteroidal Anti-inflammatory Drug Toxicity. Wolters Klewer, eMedicine. Updated 20 Dec 2017. Accessed 16 Sep 2018. Yarema M, Chopra P, Sivilotti MLA, et. Al. Anaphylactoid Reactions to Intravenous N-Acetylcysteine during Treatment for Acetaminophen Poisoning. J Med Toxicol. 2018 Jun;14(2):120-127. Doi: 10.1007/s13181-018-0653-9. Pakravan N, Waring WS, Sharma S et. Al. Risk Factors and Mechanisms of Anaphylactoid Reactions to Acetylcysteine in Acetaminophen Overdose. J Clin Tox 2008 Jun;46:697-702. Yamamoto T, Spencer T, Dargan PL, Wood DM. Incidence and management of N-acetylcysteine-related anaphylactoid reactions during the management of acute paracetamol overdose. Eur J Emerg Med. 2014 Feb;21(1):57-60. doi: 10.1097/MEJ.0b013e328364eb22. Bailey B, McGuigan MA. Management of Anaphylactoid reactions to IV N-acetylcysteine. Ann Emerg Med. 1998 Jun;31(6):710-5. Sandilands EA, Bateman DN. Adverse reactions associated with acetylcysteine. Clin Toxicol (Phila). 2009 Feb;47(2):81-8. Welcome to the fourteenth episode of AEM Early Access, a FOAMed podcast collaboration between the Academic Emergency Medicine Journal and Brown Emergency Medicine. Each month, we'll give you digital open access to an recent AEM Article or Article in Press, with an author interview podcast and suggested supportive educational materials for EM learners. Mental Health-Related Emergency Department Visits Associated with Cannabis in Colorado. Katelyn E. Hall MPH, Andrew A. Monte MD, Tae Chang, Jacob Fox, Cody Brevik, Daniel I. Vigil MD, MPH, Mike Van Dyke PhD, CIH, Katherine A. James PhD, MSPH. Academic Emergency Medicine, 2018. Across the United States, the liberalization of marijuana use has resulted in a rapid increase in the social acceptability of its use. Colorado has been at the forefront of marijuana legalization, allowing recreational use beginning in 2014. Since then, Colorado has positioned itself as the optimal environment to study health-related impacts from marijuana use. Cannabis use is well-known to exacerbate mental health illness such as schizophrenia, mood disorders, anxiety, and depression. Since legalization in Colorado, increased healthcare utilization has been associated with acute and chronic marijuana use. It is currently unknown if cannabis use is associated with increased ED visits in patients with mental illness. The primary objective of this study was to determine the prevalence ratios of mental health diagnoses among ED visits with cannabis-associated diagnosis compared to those without cannabis-associated diagnoses in Colorado. The study was cross-sectional in design, with discharge diagnostic codes collected from Colorado emergency departments from 2012 to 2014. Diagnosis codes identified visits associated with both mental health conditions and cannabis. Prevalence ratios of mental health ED discharges were calculated to compare cannabis-associated visits to those without cannabis. Rates of mental health and cannabis-associated ED discharges were examined of the study period. State-wide data demonstrated a five-fold higher prevalence of mental health diagnoses in cannabis-associated ED visits (PR: 5.35, 95% CI: 5.27-5.43) compared to visits without cannabis. In the study’s secondary outcome, state-wide rates of ED visits associated with both cannabis and mental health significantly increased from 2012 to 2014 from 224.5 to 268.4 per 100,000 (p<0.0001). In Colorado from 2012 to 2014 the prevalence of mental health conditions in ED visits with cannabis-associated diagnostic codes is higher than in those without cannabis. Due to the nature of the study design, it is unclear if these findings are attributable to cannabis or coincident with increased use and availability. Per the authors of the paper, ED physicians nationwide should be aware of the detriments of marijuana use on pre-existing mental health conditions and ED management should include counseling on cessation and rehabilitation.